We all have expectations about how to spend money, where it should come from, how much is needed for financial security, how important it is, and whether or not we can trust other people to be responsible about money. When these expectations come up against a partner’s competing ideas, serious trouble can result. 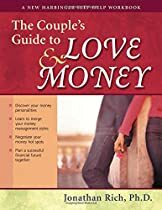 Money conflict is, after all, the most common factor cited as grounds for divorce.This practical and insightful guide helps you and your partner understand your individual money personalities. Its techniques will teach you to successfully negotiate and communicate about money, merge your money management styles, and implement the right money management techniques to achieve financial freedom together.